Activity: Is There Really Life on Mars? 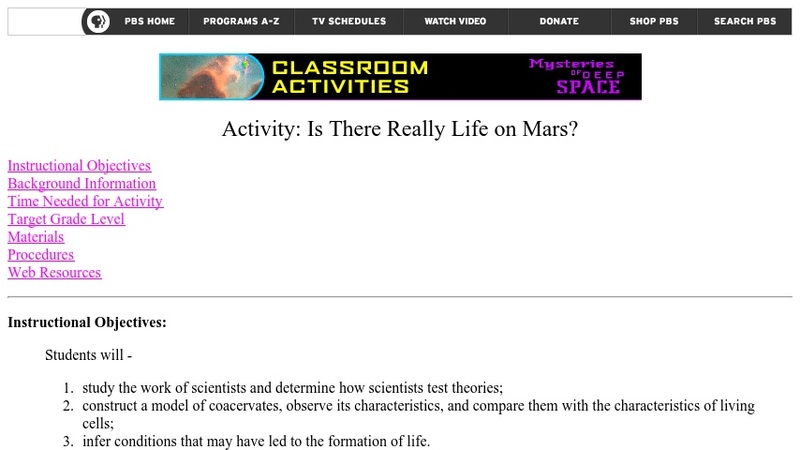 This Public Broadcasting Service (PBS) activity explores the controversy over whether or not there is life on Mars. Part of the Mysteries of Deep Space Program that originally aired in April 1997, the activity includes instructional objectives, background information, and discussion/essay questions related to life on Mars. It also features an activity where students can grow microorganisms, examine them under a microscope, and analyze their observations with the aid of follow-up questions.